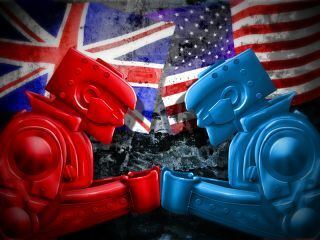 Britain vs the US: Who is the real tech titan? The Americans are sometimes quick to take credit for other people's work. For example, if you believe what you see in Hollywood films, the US invented the Enigma machine that changed the course of World War II. The truth is that much of the technology we assume is American really isn't, and many US inventions wouldn't have been possible without foreign innovation. But who is the real titan? Is the US the land of the future, or does Britannia rule the microwaves? There's only one way to find out: fight! Had Charles Babbage ever built his Analytical Engine, the UK would be the clear winner in this field. He designed the forerunner of today's machines, the first programmable computer, back in 1837. However, it wasn't until the 1930s that his work turned into real machines when Harvard's Howard Aiken took inspiration from Babbage and developed the Harvard Mark I.
MIT had created the Differential Analyzer – an analogue calculator – a few years earlier, but as it wasn't a general-purpose machine – its skills started and ended with arithmetic – we'd give the Harvard Mark I the credit for being the first general purpose computer. Then again, if it weren't for us Brits we'd still be using computers to do pretty simple things. Alan Turing, a Cambridge academic, wrote a seminal paper in 1936 ('On Computable Numbers, with an Application to the Entscheidungsproblem') that set out the concepts of a universal computing machine. On balance, then, we'll call this one a draw: the Americans may have done the building work, but the British were the architects. The digital computer was definitely a British invention, though: Colossus, the code-breaking computer at Bletchley Park, went into service in 1943, and it would be another three years before the US equivalent – ENIAC – was powered up. This field is a USA victory all the way. William Shockley, co-inventor of the transistor, started Shockley Semiconductor Laboratories in 1956. A year later, his top people jumped ship to form Fairchild Semiconductor Corporation. Fairchild and Texas Instruments were the Intel and AMD of their day – indeed, Intel was headed by former Fairchild inventor Robert Noyce. Intel invented the microprocessor and started selling it to all comers in 1971, and by the early 1970s hobbyists were happily banging together computers in their garages. America didn't invent the microcomputer – French firm R2E developed the Micral, the first off-the-shelf model in 1972 – but US firm Micro Instrumentation Telemetry System (MITS) popularised it with the Altair. The Altair led to a hobby group called the Homebrew Computer Club that boasted members including Steve Jobs and Steve Wozniak. These two Steves went on to form Apple, the company that created the consumer computing market. This sector would eventually be dominated by copies and descendents of IBM's 1981 PC. Operating systems and software Programming languages to control computers were largely US inventions (FORTRAN came from IBM, COBOL from the team headed by US mathematician Grace Hopper and ALGOL – the forerunner to Pascal – was a transatlantic effort). The first widely used operating system, OS/360, was another IBM effort. The first desktop operating system was also American: CP/M, which ran on early Intel based machines, was the creation of Gary Kildall from Digital Research. The operating system that would eventually supplant it – MS-DOS – was created in Seattle by Tim Paterson. America can claim the graphical user interface too. The Apple Lisa (1982) took the work of Xerox PARC and brought it to the mass market. Users controlled their Lisas using another US invention: the mouse (which was invented in 1968 by Doug Englebart of Stanford Research Institute). Many of the applications we take for granted are also American ideas. The first word processor, Electric Pencil, was the creation of American software developer Michael Shrayer; the first PC spreadsheet, VisiCalc, was created by Philadelphia's Dan Bricklin; and the first commercial web browser, Mosaic, came from the US National Center for Supercomputer Applications (NCSA). Even though the US didn't invent the web that Mosaic ended up browsing, it did invent the technologies that made it accessible.